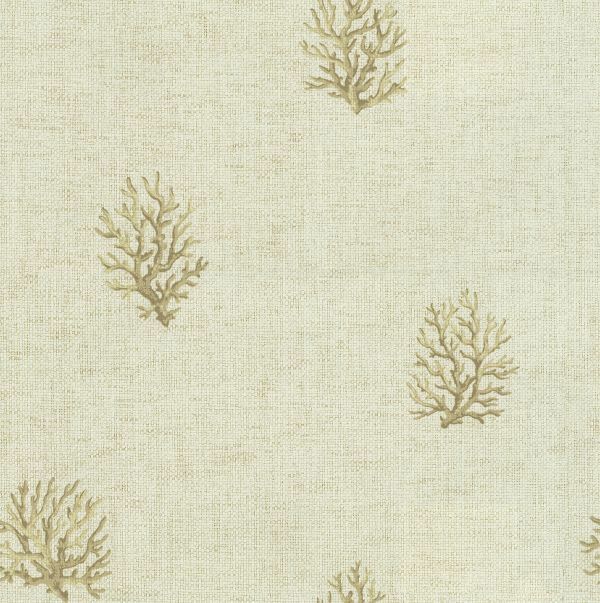 Welcome to your retreat directly on the Pacific Ocean! 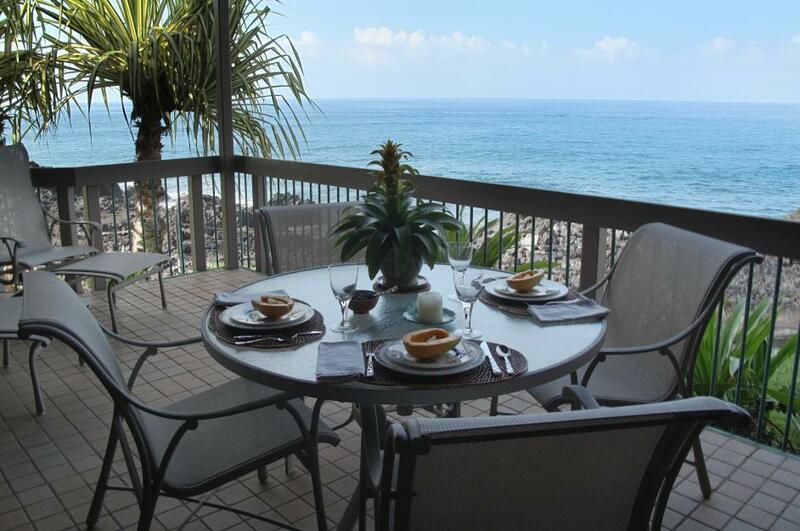 Enjoy spectacular unobstructed views of the Kona coastline. 1500 luxurious square feet await you at our Big Island condos for rent including two beautifully appointed bedrooms, two full bathrooms, indoor and outdoor dining, oceanfront living room, and private lanai. Resort amenities include three swimming pools (including one oceanfront pool), two tennis courts, a beachfront restaurant and bar, and two 18 hole golf courses at the adjoining Kona Country Club. 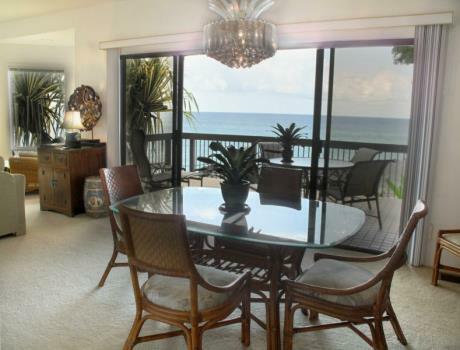 Elegant designer furniture, comfortable beds, a gourmet kitchen and the luxury of space make this Hawaii beachfront vacation rental the perfect hotel alternative. 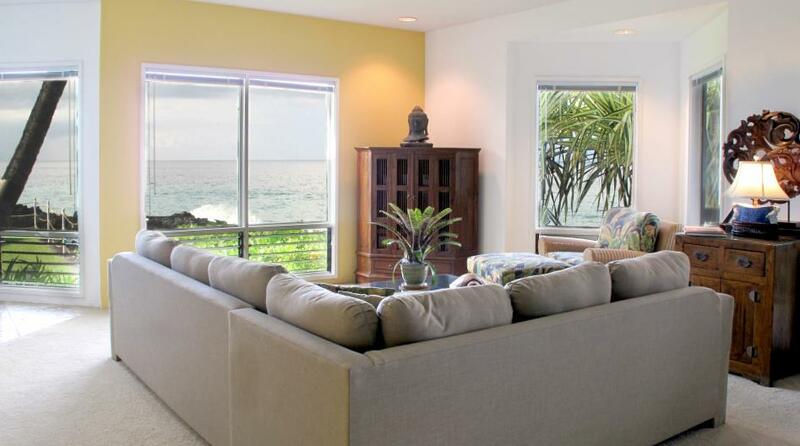 Your condominium vacation rental is located in the luxurious Kanaloa at Kona Resort on Keahou Bay. The prestigious Kona oceanfront development on the Big Island's famous Kona Coast is managed by the Outrigger Hotel Group. The private gated location is a short drive from the Kailua-Kona International airport at Keahole (KOA) which offers nonstop commercial airline service from Chicago, Denver, Los Angeles, Phoenix, San Francisco, Seattle, San Jose along with direct inter-island flights from Maui, Kuaii and Oahu. Kanaloa at Kona is situated on 18 acres of oceanfront lava rock overlooking beautiful Keauhou Bay. The well groomed gardens create privacy and beauty with tall coconut palms, lush lauae fern, and tropical blossoms. The luxurious setting invites you to relax and enjoy Kona's more than 300 days of sunshine a year. During your stay in Paradise, make time to enjoy the wonders of Hawai'i. From Mauna Kea's winter snow-capped mountaintop to the still active Kilauea Volcano, to tropical rainforests and an undersea world teeming with life, Hawai'i has much to offer the spirited traveler. Explore the coast to visit Puuhonua o Honaunau National Historic Park or Kealakekua, Bay one of the Big Island’s best snorkeling sites (just minutes away). 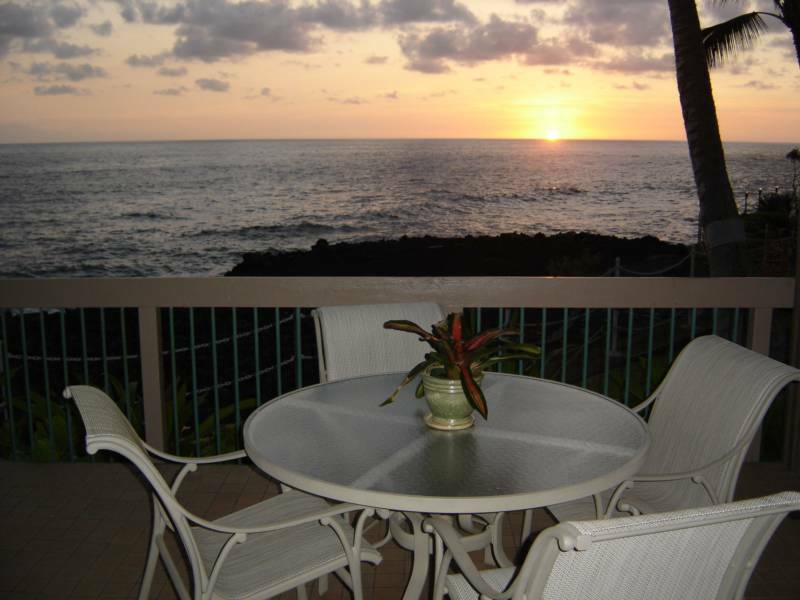 Your vacation rental home enjoys one of the best locations on the Big Island. 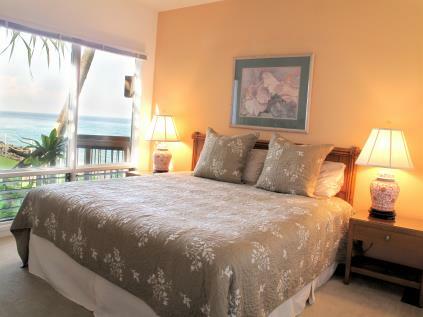 The ocean can be seen from its two bedrooms, spacious living room, indoor and outdoor dining areas and private lanai. 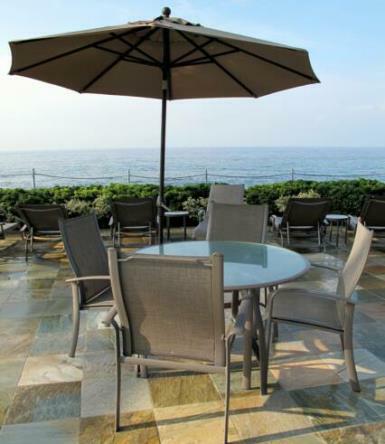 Outside you can relax on comfortable tropitone patio furniture while reading a book, watching dolphins play off shore, or taking in a spectacular sunset. Inside you will find a comfortable living room with pull out sofa, a dining room with seating for six, a well stocked kitchen with designer porcelain and silverware, two supremely comfortable bedrooms, both with king beds and quality linens, and two full bathrooms including a master bath with double shower and separate soaking tub. Wireless internet, two 40" flat panel cable tvs, dvd/blue ray and cd players and complimentary long distance telephone service assure that you can always stay in touch. Copyright 2010: Kona Waterfront | Big Island Condos for Rent. All Rights Reserved.